Labor Day, September 3rd, is approaching fast! Here are 2012’s restaurant & eating freebies & deals roundup. All deals are valid now through the 3rd, unless otherwise stated. Have a happy & safe labor day! Boston Market: 50% off Family Meal with this printable coupon. Valid on Labor Day only. There is also a $1 off $10 coupon through October 1st. Coupons can not be combined. Caribou Coffee: $2 for a breakfast sandwich or oatmeal. Must print or show this coupon on a mobile device. Firehouse Subs: Free medium sub with the purchase of a sub, chips, and medium drink. Valid on Labor Day only. Fleming’s Steakhouse: $29.95 per person for a complete 3-course dinner. Wine at $40 per bottle. Valid Sunday, September 2nd only. 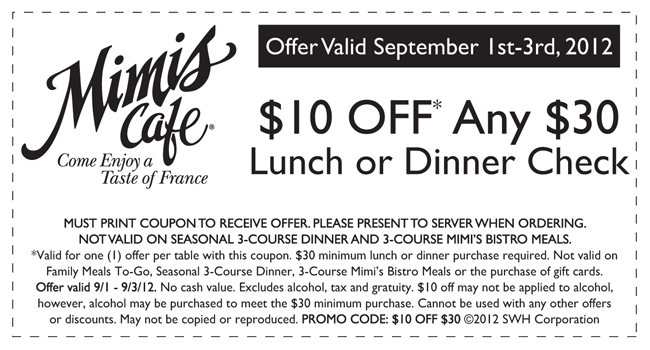 Mimi’s Cafe: $10 off $30 lunch of dinner check with this printable coupon. Pei Wei Asian Diner: Coupon code “HOOPS” good for 20% off online orders. Valid this weekend (Sept. 1 and 2) only. Romano’s Macaroni Grill: BOGO Entree with a Facebook coupon. Souper Salad: $4.99 per person for an unlimited buffet with this printable coupon. Valid through September 4th.